Returning to SFGE by popular demand, The B-Team is a talented group of musicians specializing in the sweet, sweet sounds of the ’80s. Whether you like hits from Pat Benetar, Modern English, Blondie, or U2, they’re bound to have you singing along to the classics. 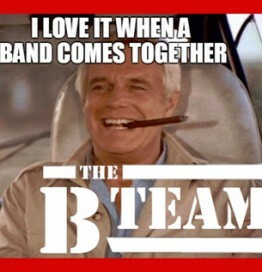 If you have a musical problem, if no one else can help, and if you can find them – maybe you can hire The B-Team.